French School of Austin offers the option of a 10-month school calendar, including June extension school, versus the traditional 9-month school calendar. School runs from the end of August to the end of June. 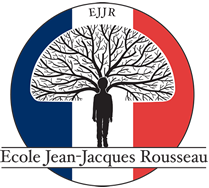 The combination of a June extended school, and 80-85% of French instruction, the school offers more French instruction than other immersion schools. Click the tabs below to view the different cycles. 7:45 a.m. – 8:10 a.m.: Parent Drop Off – Parents drop off their children at the back school door. All students are greeted by a staff member at the door to allow an easier transition into the school atmosphere. All students come into the common area. Younger students will be escorted by a staff member if needed. As we believe parent communication is important, especially for younger children, we encourage the parents to write a note to the teacher in the communication notebook to let the teacher know about any changes in sleeping, eating or behavior patterns that can really make a difference in the teacher being able to manage how a child may interact with friends and/or any activities that are planned for the day. 8:15 a.m. – 8:20 a.m.: Classroom Welcome. Free play and activity completion for the previous day are a good transition into the classroom atmosphere. Children will engage with the teachers and classmates while waiting for circle time. Our preschool program activities, on the shelves, are a combination of age-appropriate Montessori based tools, French language and writing curriculum-based activities fostering socialization, play, while reinforcing visual, auditory, sensory and fine motor skills. 8:20 a.m. – 8:45 a.m.: Circle Time. Circle Time is a very important time of the day in the French curriculum. This is time is called in French “Les Rituels”. These ‘rituels’ are an important academic aspect of the French preschool classroom. These ‘rituels’ are classifieds into “Social Rituals” and “Learning Rituals”. They aim for functional learning and give meaning to learning. These ‘rituels’ are based on the age of the child and the period in the school year. This is also the time where the children get to say an official “Good Morning!” to their friends and their teachers. They sit, relax, and begin to focus on their lessons for the day and find out about the upcoming activity. 8:50 a.m. – 9:15 a.m.: Restroom Pause & Morning Snack. This is the time of day for your child’s nourishment, and learning about personal hygiene. This is also a time, in an individual and group setting to encourage independence, an important aspect of the French curriculum. Children, starting 30 months, are learning about hand washing, taking turns, the potty, and focusing on personal hygiene. 9:20 a.m. – 9:50 a.m.: French Language Development. During this time, the preschoolers are learning to acquire a rich oral French language that is organized and understandable by others. Using tools such as nursery rhymes, songs, poems, stories, and tales they help the children develop important communication, oral language and visual/auditory discrimination skills to master, gradually, the French language. This module also includes the development of functional skills such as time and space. 9:55 a.m. – 10:25 a.m.: Recess & Free Outdoor Play or Psychomotricity (depending on the day). Let’s get moving! Movement and physical fitness are a very important part of each child’s development. Although things like hopping and skipping seem very easy to us, these are skills that we must learn as children through guided physical activities. This time of the day is about fun, play and learning how to move those big body parts! Psychomotricity is a renowned science taught in French preschools and Kindergarten. It studies man in his totality, through the relationships that establishes the student’s body/position in relation with the world and others around him. While it was a French pedagogic tool for the prevention and treatment of learning disabilities, nowadays, the French psychomotor education works with global individual, in the motor, cognitive and affective plans where the mechanical exercises are substituted by free or semi-directed activities, to develop the expression of the creative potential of the student. 10:30 a.m. – 10:45 a.m.: Restroom Pause: This is another restroom pause for our youngsters to frequently practice about personal hygiene. This is also a time, in an individual and group setting to encourage independence, an important aspect of the French curriculum. Children, starting 30 months, are learning about hand washing, taking turns, the potty, and focusing on personal hygiene. 10:50 a.m. – 11:30 p.m.: Discover the World. By approaching quantities/numbers, by discovering objects, matter, the living, shapes and sizes, and by finding/locating themselves in space and time, the children learn how to observe, think, and ask questions to develop critical and rational thinking. 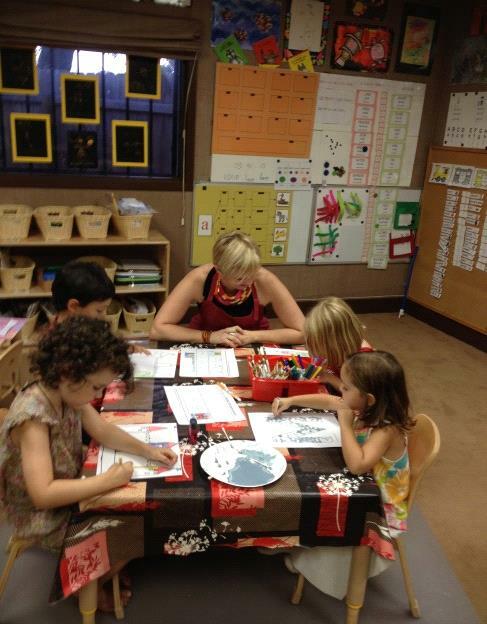 11:30 a.m. – 12:00 p.m.: Montessori Learning Time: This is a time where the children focus on the Montessori materiel. Teacher gives one-on-one or small group model lessons and encourages the children to choose their activities, allowing them to learn from their own discoveries and draw their own conclusions. 12:00 p.m. – 12: 45 p.m.: Lunch & Recess. After all our work, it’s time for a restroom break, hand washing, personal hygiene, and to replenish with Lunch before heading to another session of outdoor play. 12:45 p.m. – 1:15 p.m.: *Depending on the week day. The Art of French Pattern Making: This French based progressive teaching of prewriting is unique to the French educational system. By experiencing gross motor movements, kinesthetic and pen activity work, the children begin to establish correct pattern development which leads to improved letter formation and writing of words and sentences in a cursive script later on. They establish good habits and do not repeat inaccuracies in their formation of letters. The first benefit is to avoid the experience of children writing in capitals or reversing numbers later on, but also avoid the difficulty of breaking such habits by lacking this important French preschool prerequisite skill. Discover the Written Language: This time gradually introduces the preschoolers to the basic pre-writing and pre-reading skills. The activities of oral expression along with the acquisition of vocabulary, diversified listening situations (of many texts that the teacher tells and reads), and production of written materiel prepare our preschoolers for the learning of reading and writing. Three key activities – work on speech sounds (French phonics), acquisition of the alphabetic principle and writing gestures – greatly facilitate the systematic teaching of reading and writing that will follow in First Grade. Perception & Sensory Development / Imagine & Create: The French preschool teaches the child’s first artistic awareness. Visual, tactile, auditory and vocal skills development enhance the sensory capabilities of the child. They develop their imagination and enrich their knowledge and skills of expression while this sensory education helps them develop their attention and concentration skills and capabilities. This time is to help the child familiarize himself, by listening and observing, with the forms of the most varied artistic expression. Children also experience emotions and acquire their first marks in the world of creation. 1:15 p.m. – 1:30 p.m.: Restroom Pause After all our work, it’s time for another session of outdoor play before another restroom break, hand washing and personal hygiene. 1:30 p.m. – 2:45 p.m.: Nap Time. Phew! Now that the kids have had a full day of fun activities, it’s time to rest. Children may wake up (when applicable), progressively to Montessori hands-on activities, step-by step drawings and written activities. 3:50 p.m. – 4:00 p.m. Dismissal. 7:45 a.m. – 8:10 a.m.: Parent Drop Off – Parents drop off their children at the back school door. All students are greeted by a staff member at the door to allow an easier transition into the school atmosphere. All students come into the common area. Younger students will be escorted by a staff member if needed. As we believe parent communication is important, we encourage the parents to write a note to the teacher in the communication notebook to let the teacher know about any daily concern or change that you would like to communicate to your child’s teacher. Subjects in Cycle 2 are taught in modules of 60-90 minutes throughout the day. The following description of subjects is subject to change depending on the school year class schedules. Performing Arts and Music instruction is taught on weekly basis. 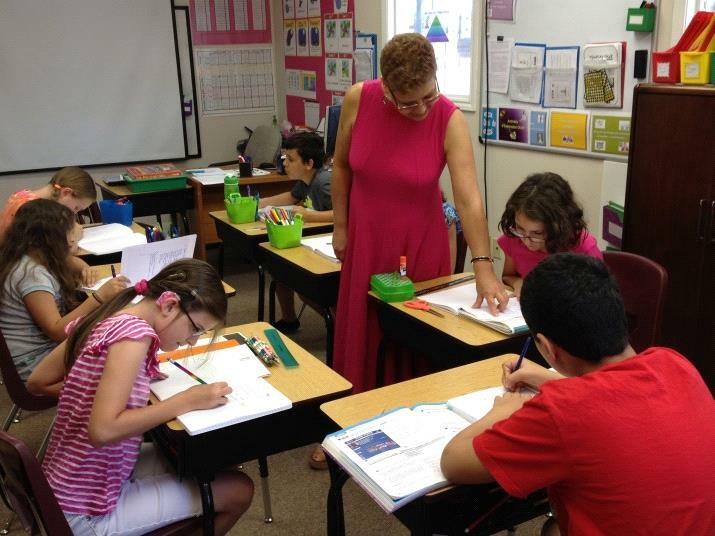 8:15 a.m. – 9:30 a.m.: English Language Arts & Singapore math– Cycle 2 students will usually start with English Language Arts. 9:30 a.m. – 12:00 p.m.: French Classes. – French subjects are dependent on the class weekly schedule and may include French Language Arts, Etude de la Langue, Mathematics, Reading, Phonics, Composition, Spelling, Time & Space. Students have outdoors breaks of 10-15 minutes every 45 – 60 minutes, including a morning snack, and a recess of 20-30 minutes outdoor play. 12:00 p.m. – 1:00 p.m.: Bathroom Break, Lunch & Outdoor Play. 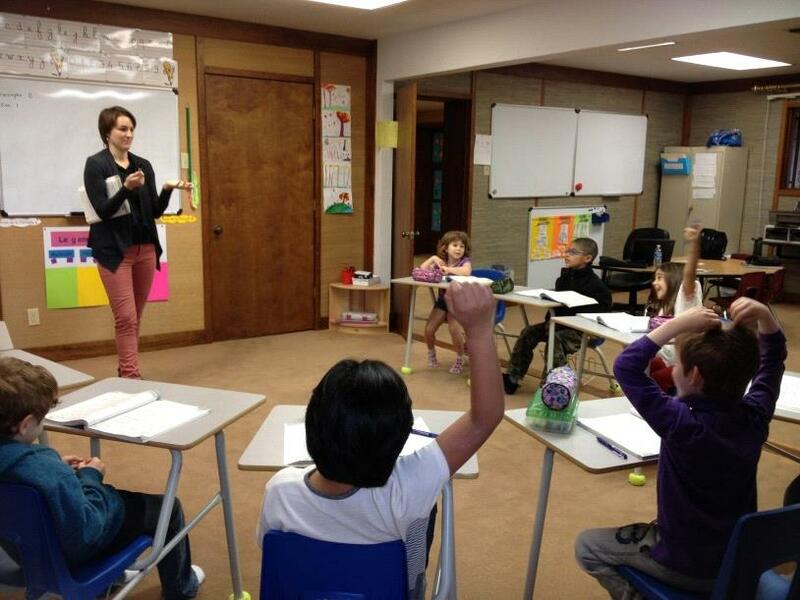 1:00 p.m. – 2:00 p.m.: French Classes. – French subjects are dependent on the class weekly schedule and may include French Language Arts, Etude de la Langue, Mathematics, Reading, Composition, Spelling, Science, Arts and Space & Time. 2:00 p.m. – 2:30 p.m.: Bathroom Break, Snack & Outdoor Play. 2:30 p.m. – 3:00 p.m.: French Classes. – French subjects are dependent on the class weekly schedule and may include French Language Arts, Etude de la Langue, Mathematics, Reading, Composition, Spelling, Science, Arts and Space & Time. 3:00 p.m. – 4:00 p.m.: Third Language Track Daily Session: Students end their day with the Third Language Track of their choice (Spanish, Arabic or Mandarin). Friday Performing Arts & String Program: Students of Cycle 2 ( K level and above) attend the mandatory music and performing arts program on Fridays. The Music & Performing Arts program include drama, singing, modern dance and violin/cello individual lessons. The Friday performing arts & String Program includes also Visual Arts, Yoga and PE classes. Subjects in Cycle 3 are taught in modules of 60-90 minutes throughout the day. The following description of subjects is subject to change depending on the school year class schedule. Performing Arts and Music instruction is taught on daily and/or weekly basis. 8:15 a.m. – 9:30 a.m. : Singapore Math & Science – Cycle 3 students will usually start with Singapore Math and/or Science class, or English Language Arts. These classes are taught in English. 9:30 a.m. – 12:30 a.m.: French Classes – French subjects are dependent on the class weekly schedule and may include French Language Arts, Etude de la Langue, Mathematics, Reading, Composition, Spelling, Science, Arts or History of Arts, and History & Geography. The morning French schedule will include a snack and a recess of 20-30 minutes. 12:30 p.m. – 1:30 p.m.: Bathroom Break, Outdoor Play & Lunch. 1:30 p.m. – 3:00 p.m.: French Classes – French subjects are dependent on the class weekly schedule and may include French Language Arts, Etude de la Langue, Mathematics, Reading, Composition, Spelling, Science, Arts, History of Arts, and History & Geography. Depending on the day, the afternoon French schedule will include an advanced drama workshop. 3:15 p.m. – 4:15 p.m.: Third Language Track Daily Session – Cycle 3 students will end their day with sessions of the Third Language Track Session of their choice (Arabic, Spanish or Mandarin). Friday Performing Arts & String Program: Students of Cycle 3 attend the mandatory music and performing arts program on Fridays. The Music & Performing Arts program include drama, singing, modern dance and violin/cello individual lessons. The Friday performing arts & String Program includes also Visual Arts, Yoga and PE classes. 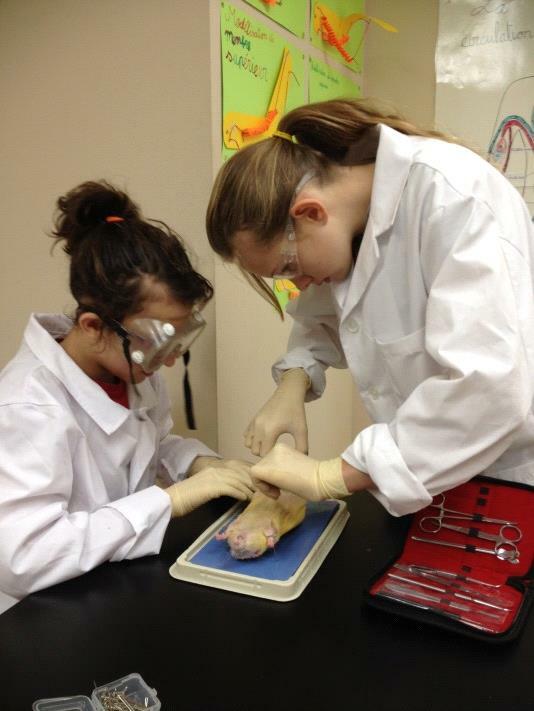 8:00 a.m. – 10:00 a.m.: Mathematics, Science & Physics/Chemistry (depending on the day). 1:15 p.m. – 2:00 p.m.: Bathroom Break, Lunch & Recess. 3:00 p.m. – 4:00 p.m.: French or Computer classes. French subjects are dependent on the week day and may include History & Geography or Writing/Composition depending on the days. 4:00 p.m. – 5:00 p.m.: Performing Arts & Music Program.